What is Kielder Winter Wonderland? Kielder Winter Wonderland is a unique, outdoor theatrical event held in the stunning forest and lakeside setting of the award winning Kielder Water & Forest Park in Northumberland. Families enjoy a full day experience of activities and surprises to delight the children with the anticipation of Christmas. 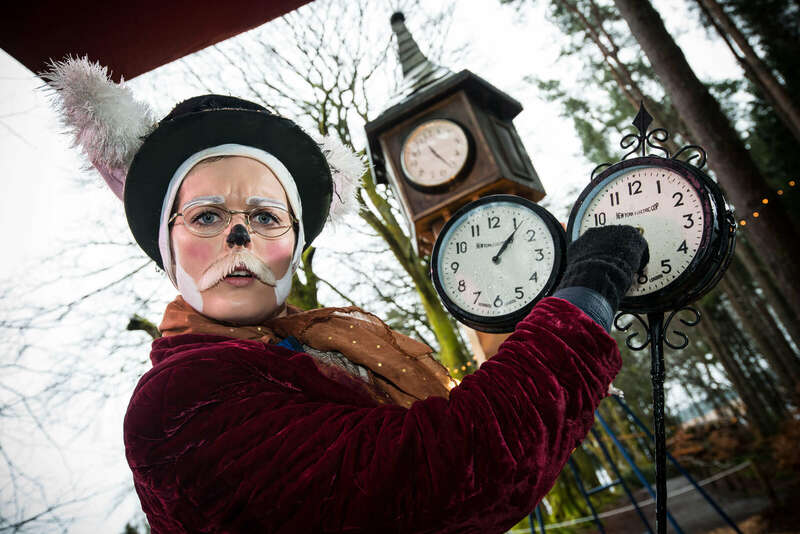 Kielder Winter Wonderland is a children’s experience ideally suited for children between four and ten years of age and as such the number of adults that can attend certain activities may be limited. Children under the age of four can still participate in all of the activities but will need some help from grown ups on the snow tube and in the elves workshop. The recommended ages are a guide only, children under 4 will still enjoy the experience and be able to participate in activities. What are your opening times and dates? Tickets are £39.50 per person. Children aged under 1 are £5 per ticket. Kielder Winter Wonderland is full day experience, times will be allocated to you when you book your tickets. We recommend you plan to arrive 30 minutes before your first event to allow time to get on site and for any delays and traffic. Lodge stays will go on sale first. These will go on sale for VIP’s from 10am on TBC and open to everyone on TBC. If you would like to book a lodge stay, we will book your day tickets at the same time, these are pre allocated to your lodge before lines open. Lodge stays must be booked over the phone and can be done so by calling 0800 111 4149. Day tickets will go on sale in September. On sale dates will be announced soon on. Day tickets can be booked online or by phone on 0800 111 4149. Group bookings of over 12 people need to be booked by calling 0800 111 4149. VIP customers are customers who have visited previously. Once you have attended the event you will be added to the VIP list for the following year. What information do I need to have when I book? Does it cost me to call you? We do not set any charges for you to call us however it is advised to check with your provider as charges could be applied by them. Do I need to pay in full at the time of booking? Tickets need to be paid in full at the time of booking. From 2018 you will now be able to secure your lodge with a deposit. Your lodge booking will be processed through our partners, Hoseasons and their terms and conditions apply. Your lodge booking confirmation will come from Hoseasons, you will then receive a separate letter from Kielder Winter Wonderland detailing all of your times and information. How do I book a lodge? Lodge bookings must be made by phone. Once lines open you can call us on 0800 111 4149 from 10am until 5pm, Monday to Friday. Does the price of the lodge include tickets to the event? What is the difference between the Reindeer and Snowman options? The reindeer and snowman options are your time to see Father Christmas. These are the same experience and are named differently to identify the group you are in. If you need wheelchair access we recommend you pick the Snowman route as this is the accessible route. What is the time for on the booking page? The time is for when you go to see Father Christmas not the time you need to arrive. The event is a full day event, your other timings will be allocated depending on the time you pick to see Father Christmas. What happens if I can't remember my username to book online? If you can’t remember your username you can register as a new user during the booking process. Simply click register and follow the steps. Warm and waterproof clothing, hats, gloves and outdoor winter footwear are advised. We also recommend you bring spare clothes for children. All tickets must be booked in advance online or by telephone. Early booking is strongly recommended to avoid disappointment. We do not sell tickets on site. Currently we sell tickets separately, a family ticket isn’t available. The ticket price listed above is for everybody aged 1 and over. If you have a child under one year the price is £5. Do you see Father Christmas individually? Your visit to Father Christmas is part of a group. You visit the elves workshop first to make toys and then go to find Father Christmas in the forest. You will see him as a group and this is where he will read out your name and the secret that you have provided when booking. Can I attend the event without a child? Kielder Winter Wonderland is a family event designed for children which wouldn’t be suitable for adults only. To attend the event you will need to be attending with a child. Yes, a booking fee of £5 will be applied when you make your booking. When you book day tickets you will receive an email confirmation. You will then receive your tickets in the post, these should arrive up to two weeks after your booking has been made. When you book a lodge break all of your details will be confirmed in a letter sent to you, this will arrive along with your tickets in the post up to two weeks after your booking has been made. Can I change my booking once it has been made? We strongly recommend that you have all of your details ready when placing your order, including dates and Santa secrets. Bookings can be changed however this incurs a £7 fee. Guide dogs and other assistance dogs are permitted on site but we do not accept other pets on site during Kielder Winter Wonderland. We currently do not have a cash point on site. We recommend you bring cash with you or we do offer a cash back service in our shop which is subject to availability. Will I get signal on my phone at Kielder? Kielder Winter Wonderland is set within the heart of Kielder forest which means signal is extremely limited. Wifi is available in our reception area and in the Boat Inn, however this will be limited service due to the number of people on site. Is the site suitable for pushchairs? Yes, we know lots of families often have prams and buggies with them and the site is fine for this. It is all mostly flat and we have pram parks to leave your prams in during events where they won’t fit inside. We recommend the snowman route when booking as this is a slightly flatter route when you enter the forest to see Father Christmas. When will I receive my Santa letter? You will receive this the week before Christmas, we send them out around the last day of postage date. Your letter is themed around the Kielder Winter Wonderland experience and the day you will have. There are some cases where the letter will arrive before you have attended the event, this mostly applies to the last dates of the event, – please do not open it until after you have been. We will clearly mark it as from Kielder Winter Wonderland so that you can recognise it when it arrives.